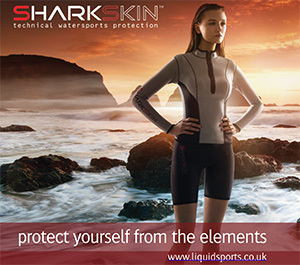 There’s long been a garage industry/tradition in surfing to build your own kit – wetsuits and boards. Sometimes this has led to lifelong careers. Jack O’Neill, for instance, is a renowned rubber dabbler which ultimately spawned a whole industry and revolutionised what we wear in the ocean. 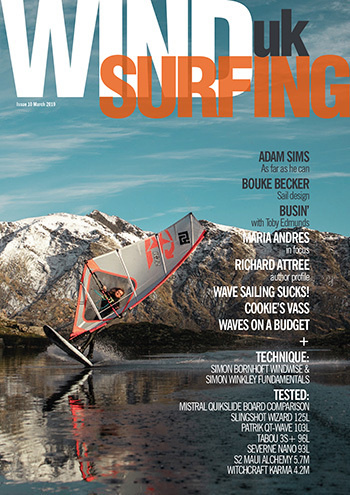 This article is by no means a definitive guide of how to build a board – I have no idea how to vac-bag as many shapers do. But my designs haven’t sunk (yet) and I’ve had a great laugh using/making them and realising where improvements need to be made. So this is my experience and will hopefully inspire a few of you to have a crack. It began when I bought a 10’2 Gong in 2009, which was OK on flat water but great in the surf. I simply wanted a bigger pointy nosed board. That’s as far as my initial plan went. Not knowing how to carve foam, but with some vague memory of planing yet never getting round to building a wooden canoe, I started researching building a wooden SUP. Weeks of trawling through YouTube followed until I stumbled upon a forum called Grainsurf, which was invaluable. You’ll notice I said my first board, because be warned, building boards is an addiction and I am now on number seven! So where do you start? An epoxy board is definitely the way to go unless you have access to heaps of woodworking tools. I’ve bought most of my blanks from Charlie Grey (CG Designs) and his advice has been invaluable. If you can master a computer programme called Shape3D you can email him a file and get a blank shaped on his CNC machine. But that’s cheating! (I wouldn’t recommend using Celatex – I tried and failed, yucky stuff!). But what shape? 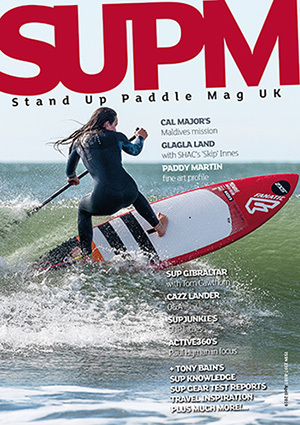 Surf SUP, allrounder or race? Whichever you go for, look at as many designs as you can. Start to examine outline shapes, rails and rockers. Then time to start measuring. I got large sheets of paper and taped them together with a central line. Once happy with the outline and everything was symmetrical, I cut out one half of the paper and laid it over 2mm of plywood. This was then marked up, labeled and kept for future boards. Once you’ve got your templates and foam you need some shaping stands. If you want the cheap option then they’re easy to make involving a few bits of solid wood, some large empty tubs and a bit of cement. 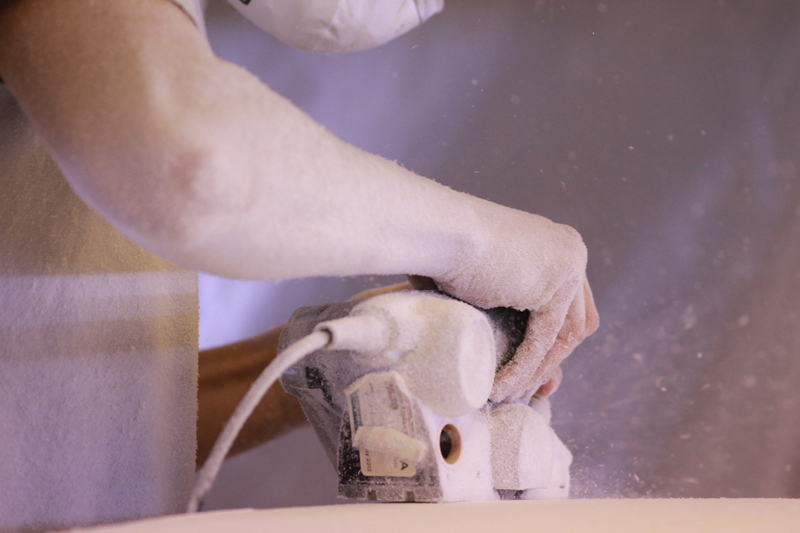 Before cutting, sanding and glassing you need to consider the safety aspect of shaping. Breathing masks, gloves and goggles are all needed. Foam, and particularly epoxy, are not to be taken lightly so read up on safety for what you’re using. Seabase will give good advice and sell everything you’ll need. Rocker lines are difficult. I’ve been lucky with a few blanks that have already had some sort of curve already there. If not an electric planer makes life a lot easier. Measure the rocker on other boards. Take the fins out and see how much nose and tail rocker there is to get some ideas. When you’re happy with the bottom and deck contours it’s back to looking at boards, researching more on the web and trying to understand how to carve the rails. Rail bands are important apparently. In other words counting the passes you make with the plane – once I realised this (after board no 4) everything was much easier. Then it was time to research soft and hard rails, what they are and where they go on the board. Generally if you can feel an edge it’s a hard rail and will help the board turn fast, so is often at the tail end of a surf SUP, for instance. Following that the next job is a lot of careful sanding. But no time to stand around congratulating yourself, the next job is glassing. Or if you’re feeling more creative add your own personalised design, and of course not forgetting your logo. Whatever you do, colour or not, when using an EPS blank you need to spackle! Basically fill the small holes with a fine watered-down filler. Use distilled water or it turns yellow. To paint I just use watered down acrylics and brushed it on. Play around with designs on paper first because once it’s on, it’s on. I’ve made up templates, used stamps and just painted freehand with varying degrees of success. You could go for a resin tint in the epoxy. Check out Mexican blankets on the web, they’re beautiful. Bluff longboards in Sennen make some stunning examples as well. You can buy epoxy resin from a few places. Again it must be epoxy if you’re using EPS foam. Polyester resin will turn your newly shaped board into a Barbara Hepworth sculpture! I buy from Seabase who sell an epoxy called resin with additive F. This is brilliant stuff, safe to use and has no odor, unlike other epoxy resins. They also give some great advice, as I’ve mentioned. You’ll need three lengths of their widest 6oz cloth, which isn’t on their website. Two layers for the top and one for the bottom. Add a few extra feet, as I always do, to reinforce the standing area. Layer the cloth over the bottom and cut to length, then trim leaving a rail overlap. Get everything ready before pouring any resin. Make sure you’re not disturbed and can concentrate and watch some more vids to see how people move the squeegee across the board. Make sure you’re happy and everything is in place: timer, squeegee, two pairs of rubber gloves on each hand (so you can take one off as they’re soaked in resin and you can’t hold anything!). Mix up the resin and go for it. Once it’s dry flip the board and if you’re feeling brave, and want to do both layers of cloth in one hit, then repeat for the deck. I often have problems with the cloth not saturating through both layers, so do them separately. It’s not necessarily good practice but I never professed to being a pro. Then it’s more careful sanding – don’t go through those rails, be careful! It’s then time for the hot coat. Mixing up less resin, taping the sides and brushing the resin beautifully onto the board is another skill. When dry adding a leash plug and fin system is the next task. Definitely the scary bit as it usually involves routing a big hole into your beautiful shiny new board. I’ve used a variety of different systems but for a first board I’d just put a single US fin box in. Again, refer to YouTube for guidance. So now you’re finished, the board is sealed, looks great and has a leash plug and fin. A ton of sanding could now follow and even a gloss coat to get it all shiny, or you could just stop. It won’t be perfectly smooth but it will work and you’ll be on the water. My daughter’s 17yr old school friend built a 10ft SUP for her A-level project and after glassing just wanted to get on the water. Her board is going just fine. There you have it! A journey through my board shaping experience to date. They’re not perfect but they work well and are great fun to make and ride. If my daughter’s friend with no experience at all can make one, then so can you. Your creations may not replace your production SUP but it’s a skill to have and will, at the very least, help you understand how to repair your usual ride.